So here he is today. I think he has doubled in size since I brought him home, what, a couple of weeks ago? Notice how he’s not holding still? That’s typical. I believe I got this shot just as he was about to jump up and check out the iPhone. I am making chicken soup for dinner; he may have thought a bit of that lovely poulet noir was attached. The word for this dog is “mignon.” Fashionably dressed young women leave their shops to run out onto the sidewalk to tell me how cute he is. “Il est si mignon!” It’s one of my new standard phrases, along with “Quel age a-t-il?” Okay, I knew that one, but I didn’t have “how old is he” on the tip of my tongue. Jacques is teaching me French. If you move to France you have to give up on the idea that your life will function in an efficient manner. You could run into a strike or a demonstration. It could be Sunday or some part of your local merchant’s day or lunchtime off. Or, well, you could have a French puppy. Jacques thinks every moment is another opportunity to play. Today at the flower shop I stood in line and tried to hold my purchases as Jacques tried to consume the nearby tulips. I tried to sweep the floor as Jacques tried to eat the broom; when Moses arrives in June we’ll see about posting video of that. If I were holding Jacques in my lap right now, he’d be walking on the keyboard. He is great fun. He is teaching me to be more French. He triggers French tutors. It turns out that every third Parisian has a dog story and they want to tell it, no matter what. It is the first time I have dealt with them and had them not clam up when it became apparent that I was losing the thread. I can listen, use a suitable phrase at suitable intervals and all is well. This is a first for me, this small talk in French thing. I am enjoying it. He’s a very cute puppy. love him from here. 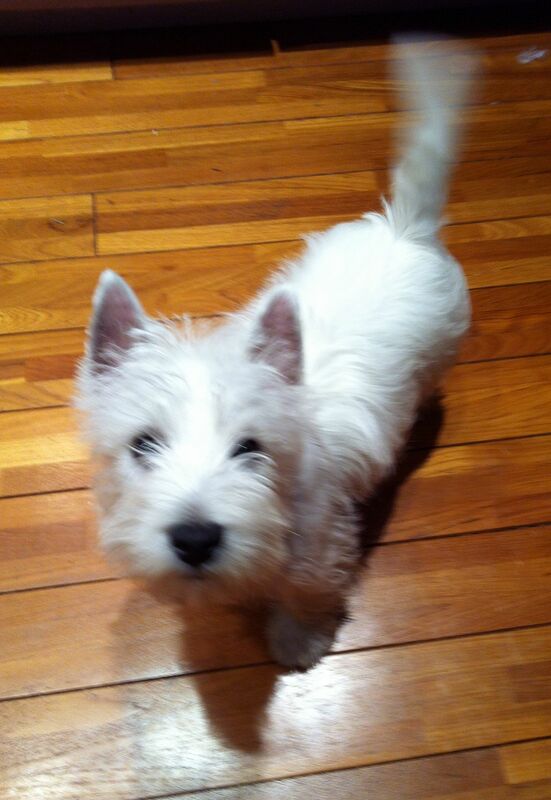 I have a terrier, white silky (pound puppy). My second terrier. So smart and wonderful. Previous Post I have competition!